Friday’s inaugural Bahrain Night Half Marathon attracted some of the world’s top half marathoners to a race that offered a staggering $100,000 for the winner, one of the richest first-place prizes in the sport of running. The bad news was almost everything else associated with the race, which, despite the money being poured into it, felt like amateur hour from start to finish. In fact, let’s start with the finish, where Ethiopia’s Jemal Yimer, Ethiopia’s half marathon record holder, made a $75,000 mistake in the men’s race. After crossing underneath that first, Yimer came to a stop and began to celebrate, only to realize that the actual finish line was roughly 50 meters down the road. Yimer’s celebrations quickly turned to confusion; he threw his hands upon his head as Hadis streaked away to win the $100,000 prize in 59:42. Yimer was forced to settle for $25,000 and second in 59:45. See what we are talking about in the video clip below. Hadis celebrates while Yimer can’t believe it behind him. Meanwhile a random woman jogger is right next to them. The race went out slowly, with 20 men in the lead pack at 10k (29:07, or 61:25 pace). But the pace gradually picked up until the leaders were hammering late in the race; according to the race’s timing website, Hadis ran his final 6.1k in 16:27, or 13:29 5k pace. 2019 has been a rough year for Yimer, who ran the fastest debut half ever last year at RAK (59:00) and set the Ethiopian record in Valencia (58:33). Back in January, Yimer was in a similar position, leading the Houston Half Marathon in the final half mile, before briefly following the lead truck off the course as they approached the finish. Just as today, Yimer lost his momentum and wound up finishing second as Shura Kitata outkicked him for the win. 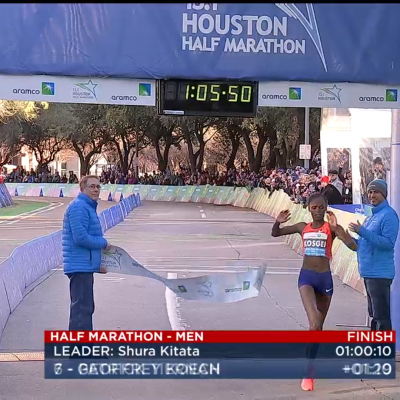 In the women’s race in Bahrain, Kenya’s Brigid Kosgei kept her hot streak going, winning the $100,000 in 65:28 (#10 all-time) after claiming titles at the Chicago Marathon in October and Houston Half in January. 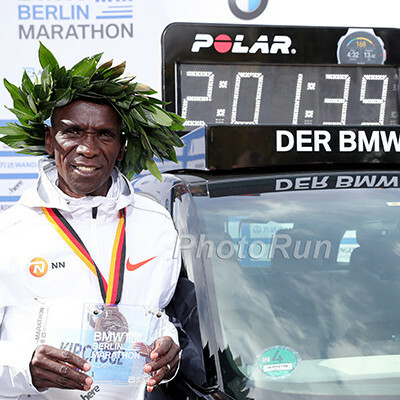 At 15k, Kosgei was in a battle with Dubai Marathon champ Ruth Chepngetich and World Half Marathon champ Netsanet Gudeta, but wound up crushing the final 6.1k from 15k to the finish in 18:08 (if the timing system is to be believed). 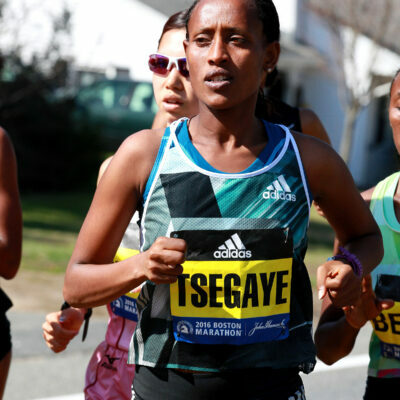 That is 14:52 5k pace; Sifan Hassan’s road 5k world record, set last month in Monaco, is 14:44. 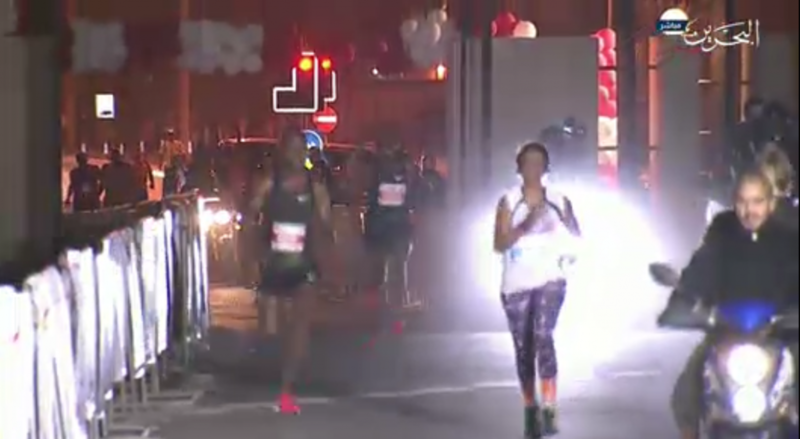 Despite the high-quality action, the Bahrain Night Half Marathon had a very bush-league feel to it. It began before the race even started as we didn’t even learn about the race until the day before, when journalist Alberto Stretti published the start lists on Twitter. And it’s a good thing he did, because there is no way to find the elite fields on the race’s website. In fact, almost none of the information any fan of the sport would want to know for following the race — leaderboard, results, link to an online stream — was made available on the race website. 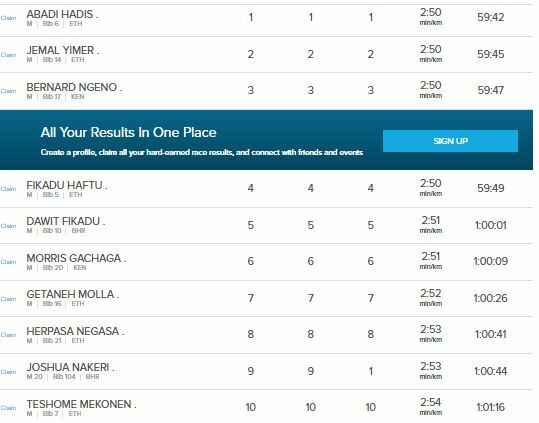 The leaderboard, once we did find it, was inaccurate — it listed Kenyan Bernard Ngeno as the winner of the men’s race for almost an hour before the error was corrected. And the live stream was borderline unwatchable: an overwhelmed, unidentified Irish voice, speaking over the same 10-second clip of dance music endlessly looping in the background. It felt like a parody of a race broadcast. Honestly, we felt bad for the commentator — clearly, he had no more information than we did — and it was painful to listen to him call a race in which he could not identify any of the athletes (in his defense, it was difficult given that the camera was too far away to read the bibs clearly; it didn’t help that the race was held at night). And we haven’t even gotten to the experience of the athletes themselves, who had to dodge other runners (who we believe were finishing a shorter race), and at one point, a car. Unlike most major road races, only one lane of traffic was closed during the final miles of the race, with a set of cones dividing the athletes from the vehicles. But one vehicle did manage to find its way through, forcing the lead men to split it as they plowed on toward the finish — something we can’t recall ever seeing during the final mile of an elite road race. Hobby jogger, watch out. $100,000 is on the line. All in all, the event felt unprofessional, a race environment unworthy of the dozens of talented athletes who chose to compete there. We feel awful for Yimer, who was in tears after the race, but even if the race was somewhat disorganized, ultimately he is the one responsible for knowing where the finish line is — and you would think he’d have taken extra precautions this time after the disaster in Houston earlier this year. We can understand why he thought the gantry where he stopped was the finish line as it did resemble what a finish line typically looks like. But Hadis knew to keep running, leaving Yimer to make what was ultimately a $75,000 mistake (the difference between prize money for first and second). That is assuming, of course, that Hadis would not have caught him anyway (it was kind of hard to tell as the broadcast changed angles as Yimer came to a stop). One thing is clear, though: Yimer is in terrific shape. He ran 59:14 and 58:33 in his last two half marathons in 2018 and has taken second in two of the strongest half marathons in the world so far in 2019, despite finish mishaps in both. If Yimer hadn’t stopped early, we can’t say with 100% certainty that he would have won as Abadi Hadis is pretty darn good. 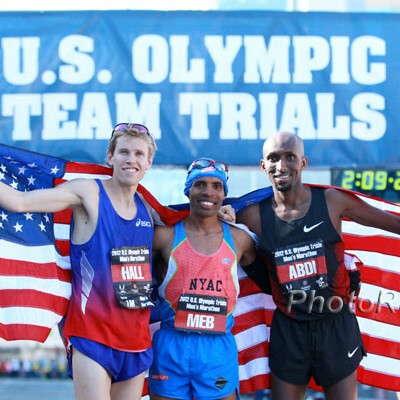 The 21-year-old Hadis has track pbs of 12:56.27 and 26:57.88 and has run under 60:00 in three of his four half marathons, including two sub-59s. 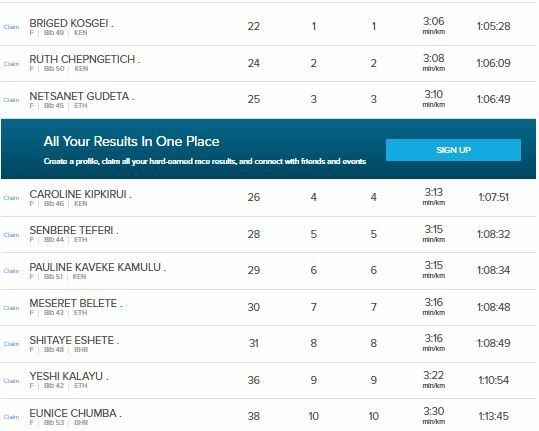 As if you needed another reason to get excited for the 2019 London Marathon — a race that we have already praised for assembling the greatest women’s marathon field ever — now we have Brigid Kosgei laying waste to the competition on the roads this year. 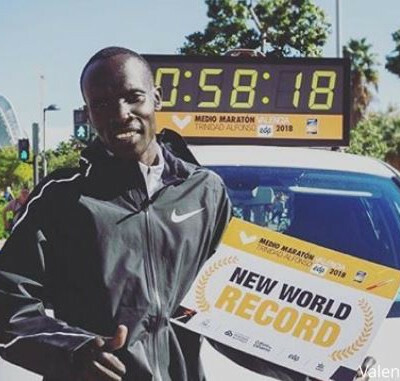 In January, Kosgei ran 65:50 in Houston, winning by 58 seconds over a field that contained Fancy Chemutai (64:52 pb, #2 all-time) and Ruti Aga, who just won the Tokyo Marathon. Today, Kosgei put 31 seconds on Ruth Chepngetich, the third-fastest female marathoner in history, and World Half champ Netsanet Gudeta. That would make Kosgei, who was 2nd in London and 1st in Chicago last year, the red-hot favorite for whatever marathon she runs next, but with Mary Keitany, reigning champ Vivian Cheruiyot, and many more stars all running London this year, that’s no sure thing. One thing we know for sure: we can’t wait to watch that race. 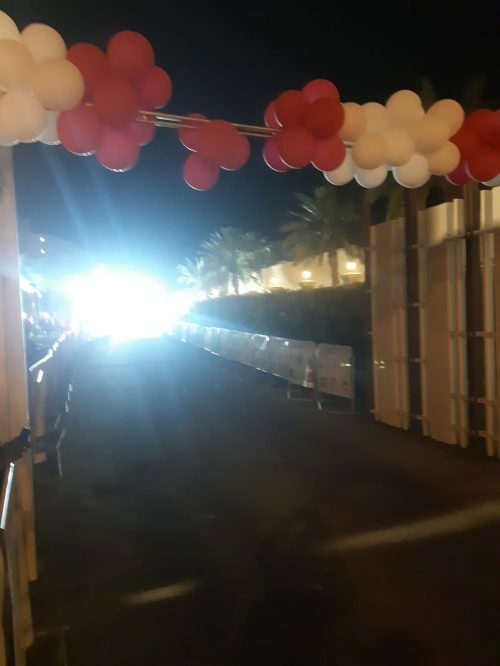 We love when organizers invest in the sport, and the people behind the Bahrain Night Half Marathon clearly did that, assembling two top-notch fields and a prize purse totaling $358,000. But if you’re going to put that much money into a race, you need to promote it. Reach out to media organizations. What is the point of having a race with stacked fields and fast times if no one knows about it? 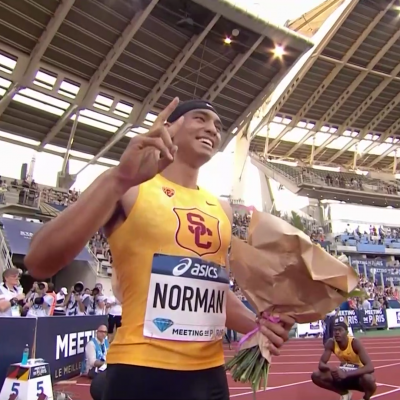 If you’re going to have elite fields, a timing website, and a live stream, link to those things on your website! And if you’re going to have a live stream, put the commentator in position to succeed. 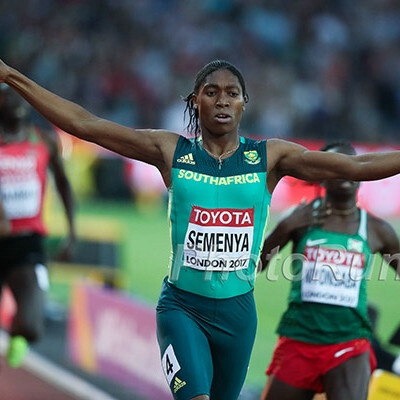 Give him/her access to timing and make sure they can identify the athletes as they’re racing. Use graphics to provide split times. And for goodness sake, put a clock on the screen! Yes, these things cost money, but so does staging a major half marathon in the first place. If you’re going to do it, do it right.